I’m not one for offering tips, but as I struggle to reconvene working after a few weeks away this seems like an appropriate moment to think about strategies for keeping going when the will is weak, for whatever reason. The first thing I tend to do if I’ve had a break or have simply lost the plot is review my plan. If you don’t have one, the point where it’s hard to keep going is a good time to make one. The best time is before you start writing. It doesn’t need to be overly elaborate to start with, perhaps just three points to remind you what you intend to happen at the beginning, middle and end of your story, bearing in mind that any of it it can (and probably will) change at any juncture. I find it useful to write my plan in some format that allows for easy additions and subtractions of important detail and overall narrative changes as I go along. (I used to do this on sheets of A4 but I’ve recently discovered Moleskine’s Storyboard notebooks, which I carry around with me and populate in pencil –Blackwing Palomino for the stationery nerds out there – for easy amendment.) This functions as a memory aid as much as anything else so the key is to remember to update as you continue to write so that you can flick through at any point to remind yourself what the hell’s going, or, look for a clue as to what might holding things up. There’s always something. If you’ve identified a problem, glaring, or more subtle, and are struggling to find a way to tackle it, then reading is always a good next step. I believe we learn more from reading other authors’ published work than from all the writing tips in the Twitterverse, so pick up a book that deals with a similar technical issue and figure out how the author’s made it work, or if you think they haven’t, work out what you would do differently. And then do it. Reading for pleasure and reading to gain technical insight (we should all be doing both, all the time) are different experiences. When they overlap, it is a wonderful thing. Alternatively, read a relevant chapter in David Lodge’s The Art of Fiction. Underline pertinent passages, make relevant notes on your plan. If nothing else, you’ll feel like you’ve done some work. If your writing still seems a bit tired, take out all the adverbs and strengthen up the verbs to perk it up. There are other reasons that keeping going gets hard. For a start there are those pesky mental-emotional impediments – it’s complete rubbish, no one’s going publish let alone read it, etc etc. Well those are never going away so you need to find a way to wave at them and keep going regardless. Some of what you write will be rubbish, especially at first draft stage; equip yourself with the critical tools to recognise the rubbish bits for what they are and improve on them when the time comes. Gibb’s Reflective Cycle is a useful tool for understanding how to process criticism, whether internal or external and move beyond the emotional response. It is worth checking if your penchant for writerly solitude hasn’t tipped over into loneliness. Especially if you live alone, it’s easy to go for days without speaking to another person when you’re entrenched in a draft. It might only be when you hit a stumbling block that you look up and realise you could do with some company. No matter how in awe of your slavish devotion to creativity your friends might be, they’d probably much prefer to hear from you now and again. Don’t forget to stay engaged with the world outside your novel or eventually you’ll run out of things to write about anyway. Sometimes (often in my case) our bodies rebel too. If you’ve got ants in your pants, don’t fight it. Put some music on and dance around your computer or go out for a walk with your notebook and reflect on your reflections. Stretch or do yoga. Or write standing up for a while. Whatever your body allows you to do. Your brain will continue working on your novel while you’re away. If all else fails, spare a thought for poor old Roland Barthes, who was run over by a laundry van on the rue des Écoles before he could put the brilliantly meticulous and laborious theories and methods detailed in his series of lectures The Preparation of the Novel into practice. Or listen to a debate on Brexit. If that doesn’t send you scurrying back to the safety of your imaginary world, nothing will. Martine McDonagh is the author of three novels. Her latest, Narcissism for Beginners (Unbound) is shortlisted for the 2018 People’s Book Prize and was longlisted for the 2017 Guardian Not The Booker Prize. It is also published in Germany by HarperCollins as Familie und andere Trostpreise. Her first novel, I Have Waited, and You Have Come (Myriad) was longlisted for the Authors’ Club First Novel Award. She has also published short fiction and journalism. Martine had a successful career in the music industry as an artist manager and from 2014-2018 she designed and ran the MA Creative Writing & Publishing at West Dean College in Sussex. 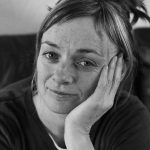 She has a Creative Writing MA from Manchester Met and is on the judging panel of the Myriad Editions 2018 First Drafts Competition. She grew up in Bristol and has lived in Manchester, London and Brighton and now lives in West Yorkshire.